After a day stopover in Ueno, Tokyo we were on our way to Los Angeles. Crossing the International Date Line meant it was going to be the longest Saturday ever, even longer than that 3 day bender in college where I was down to drinking Vodka and cordial dregs from the night before by the end of it… but that’s another story. It’s true what they say, “nobody walks in LA”. Simply because everything is so far apart… and to add to it, the public transport is pretty rubbish for a major city. So your best bet if you’re staying longer than a 2-3 days is to hire a car. Being the USA this can be quite cheap but remember you will need to find and pay for parking. Since we were only there for 3 days we opted to skip the car and go with the alternatives. Coming from the airport, the easiest and quite reasonable option for door to door is to use Super Shuttle, a private shuttle bus company at pretty much every major city in the States. They’re easy to spot as you leave the terminal, big blue vans with bright yellow writing. You can just go to the stop and wait for one or pre-book, save a few bucks and guarantee yourself a seat, roughly $20-25US. Note that you will more than likely be sharing with other passengers over several pickup and drop off points so the journey can take some time. We also noticed there can be a lack of order/priority at times between the driver and the representative at the pickup point, pretty much whoever yelled/nagged or was stubborn the most got their way! If you’re on a tight budget then your only real option is to catch a bus which may not be feasible if you have to make 3 transfers and still have to hike it with all your luggage. The up side is it’s a fraction of the cost (round $5US) and you don’t need to tip the driver. After circling LAX 3 times with a full van load we hit the motorway along with LA’s oblivious sloth-like drivers. A bit over an hour later we were at our hotel, the modestly luxurious Double Trees in Santa Monica. 4 star/3 diamond rated, short 10min walk to the beach, 15min to the pier and definitely one of the better priced hotels for the location. The big warm chocolate chip cookie on arrive was a nice touch 🙂 Room size was more than adequate, large lounge area with kitchen space and large bedroom. Not to mention it was so good to have a shower after wearing the same clothes for more than 56hours! I wrote a more detailed review on Tripadvisor, complete with a whinge about housekeeping taking our shoe boxes! We only really had one major day for shopping in LA so we wanted to make it count. 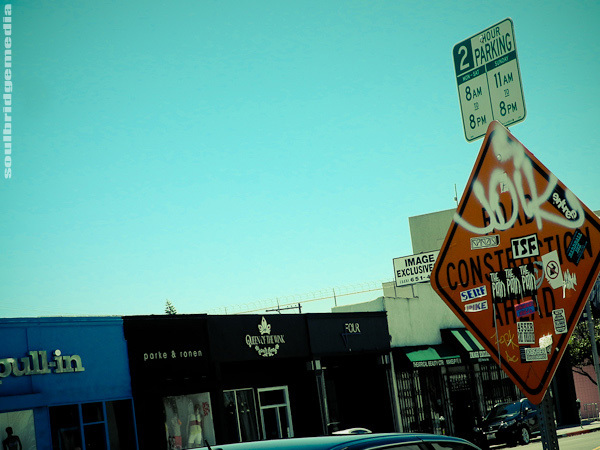 While downtown has it perks you really cant go past the one stop shop, that is West Hollywood. 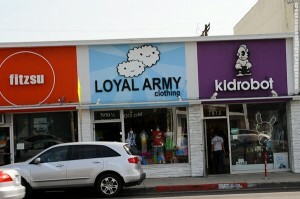 If you want strictly high end designer gear than you’ll wanna keep going till you hit Hollywood for some Rodeo Drive action, otherwise this is a great place to start for modern streetwear, quirky vintage, good selection of sneakers and a generous serving of everybody’s favourite retail dish, sales! First stop is Melrose Ave. complete with “Melrose place” (the street, which looks nothing like the show and no one actually comes back to life after they die (if only it was the same for the show)). This stretch of 10-15 blocks is great for a day, or even a half day power play shop-over. Heading east you’ll hit Bape, Adidas Originals and then a little cluster of the coolest group of shops you’ll ever come across. 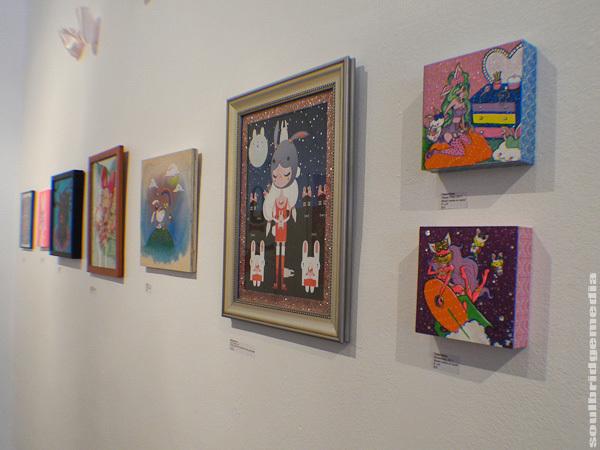 Kidrobot, Tokidoki and Loyal army covers the Japanese inspired art, vinyl collectibles and apparel so cute you’ll leave with sore thumbs from pinching the cheeks of everything there! Paul Frank continues this theme with their large store. They had quite a few items on sale but on the day we were there they were also handing out scratch-it coupons where you received a mystery %-off discount. The shopping gods smile upon us that day as we scored 40% off. If we didn’t have to try and get it home, the beach cruiser bicycle would be sitting in my garage right now! 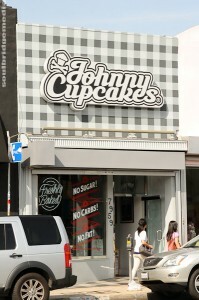 The last shop of mention in this group is one of our favourites, Johnny Cupcakes. 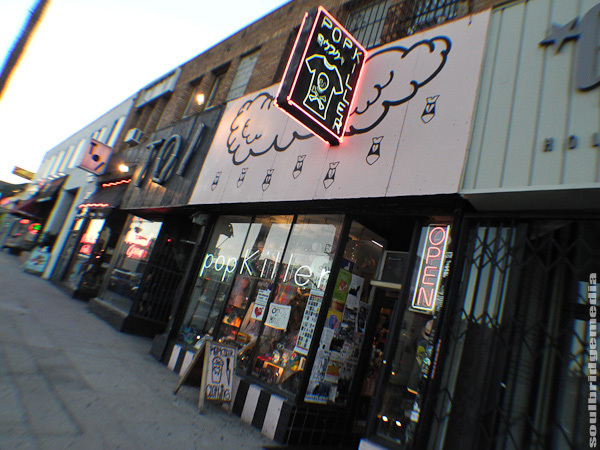 For those that don’t know, no, unfortunately they don’t actually sell cupcakes, but they do sell cupcake related clothing and accessories in a less cutsie and more So-Cal rock kinda way and the store is set up like a 50’s bakery! Retro ovens, display cases, fridges and even a black and white checkered floor. Most of the items are in the fridges and a café pastry style display case. Not only that Mr. Cupcake, Johnny Earle himself is quite the entrepreneur and only too happy to share his knowledge on his blog and tours business seminars to uni students and work expos. The designs range from baseball and sport themes to their classic cupcake and bones logo, all in a variety of bold and vibrant colours. What makes the designs special is they are all limited, once the batch has sold out that is it forever. Definitely one way to not be another General Universal Pants clone. 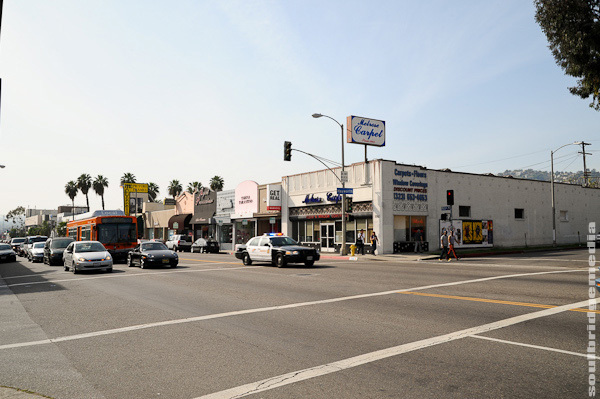 A couple blocks along Melrose, you’ll hit North Fairfax Av. With Flightclub LA and Supreme. Flightclub has a feel of a Hong Kong or Tokyo shoe store. 2 large walls from floor to ceiling of shrink wrapped sneakers, very impressive. They also deal in pre owned items like K-Skit but don’t opening advertise it as such, so if you’re after brand new, you might want to check first. Either way, you’re in for some bargains and maybe some rare finds. The selection is predominant Nike and Jordans with a scattering of other brands, a small rack of tees and a selection of G-Shock watches and New Era caps. I picked up 2009 Nike SB Greenbay Packers for $60US, which are more than double that to buy locally at $160AU rrp and 2009 Nike AF-1 Armed Forces Ltd Ed. for $70US. If you’re still feenin’ for sneakers, back on Melrose is Sportie LA, which is divided up into 3 separate stores, new footwear, new apparel and preowned. The new footwear store is one of the few places that focus less on Nike, in fact they don’t even have a brand listing on their site, instead they opt for Converse, Adidas, Vans, Asics, Supra and even LA Gear. Though if you’re looking for some rarities or a bargain or just something a bit different than the norm, the preowned store is the one to scope out. There are some items that have clearly been on display forever and are subsequently “shop soiled” and dusty (no shrink wrapping), but the majority of the stock is in good/mint condition. Further in to the store is all new stock, with plenty of boots and dressier shoes for the ladies. 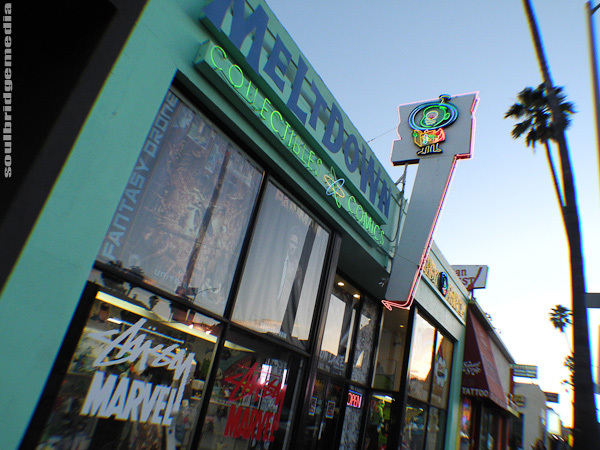 Stay tuned for part #2 when we continue to cruise down Melrose, up La Brea to Hollywood Blvd.